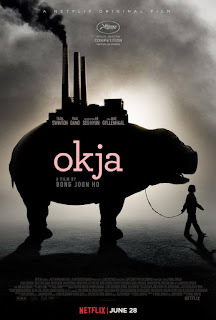 I think there are basically two reasons why Okja didn't work for me. The first is I don't normally enjoy "kid and their pet" movies. I know they are a popular genre but they rarely speak to me. The other is that normally I don't enjoy absurdist approach. I understand director Bong Joon-ho's approach here, but I found it pulled me out of the film too often. These two elements are what the film Okja is based on. Bong Joon-ho makes his comment on capitalism, the food industry, and colonization by juxtaposing two view points. First the earnest, heartwarming relationship between young girl Mija and her ultra adorable "super-pig," a giant hippo like animal she has raised at a multinational's request, a biological organism designed by that multinational to be a source of food. The second the world of "adults" who are presented as acting as absurd, buffoon like, as possible. In his heavy handed way, Bong Joon-ho tugs sentimentally at our heart strings with the "kid and their pet" subplot and instills in his audience disgust in the horrible methods and behaviors of all the adults Mija interacts with. The adult characters are so over the top ridiculous we can't help but hate them. From the corporate types (lead by Tilda Swinton chewing scenery like she's on Dynasty), to the television personalities (personified in the disastrously evil Jake Gyllenhaal) to the incompetent and motivationally suspect animal rights activists, anyone who isn't Mija or her grandfather is a caricature of a human being.Yes it is clear what is going on. It's hit us over the head clear. It is far too much hand holding for my tastes. Bong Joon-ho, as in his previous works, visually stuns us. There is enough beauty here to make it enjoyable to watch. And the scenes with Mija and Okja are lovely if not a little sickly sweet. I'm just not sure I was able to care after all this sugar.